Today in 1992, four Los Angeles police officers were acquitted for using excessive force on Rodney King. After the announcement, a riot erupted in the city that led to 53 dead, thousands arrested, and nearly $1 billion worth of property damage. William Barr: "I can’t tell the extent to which he [Bush] was shocked. He seemed surprised and wondered what was going on, what was this all about and why the violence, that ugly violence. He asked me. Some people would probably disagree with what I told him, but I did lay a lot of it on gang activity." Dr. James Young: "And you had a program to try and deal with that kind of thing." Young: "But that didn’t galvanize." Barr: "Well, no one stopped me. We did make a lot of progress against gangs. But he wasn’t as comfortable in that policy area, I guess. My basic take was that this was not civil unrest or the product of some festering injustice. This was gang activity, basically opportunistic. I don’t know why he wasn’t more interested in these issues." This is a fairly telling discussion. The causes of the L.A. riots, like the one in Baltimore this week, were more complex than just gang violence. Police brutality and mistrust and economic and legal inequality were just a few of the issues that helped spark the riots. Another point is that President Bush was uncomfortable on these issues. Today, it is important that the 2016 presidential candidates and all of us be comfortable talking about them. 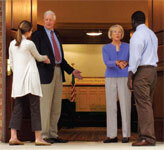 The Miller Center can help as we launched a series of Forums entitled What Now? Dialogues on Race in America. And watch a Great Issues clip with Dr. Robert Samuel Smith discussing economic justice in the Civil Rights Movement and today.